Meet baby Pippa. What is it that makes Pippa a commodity? Announcing the arrival of baby Pippa! Delivered into my arms by my friend and colleague in rescue, Janine, who grabbed Pippa when she fell out of the cage in a recent rescue. 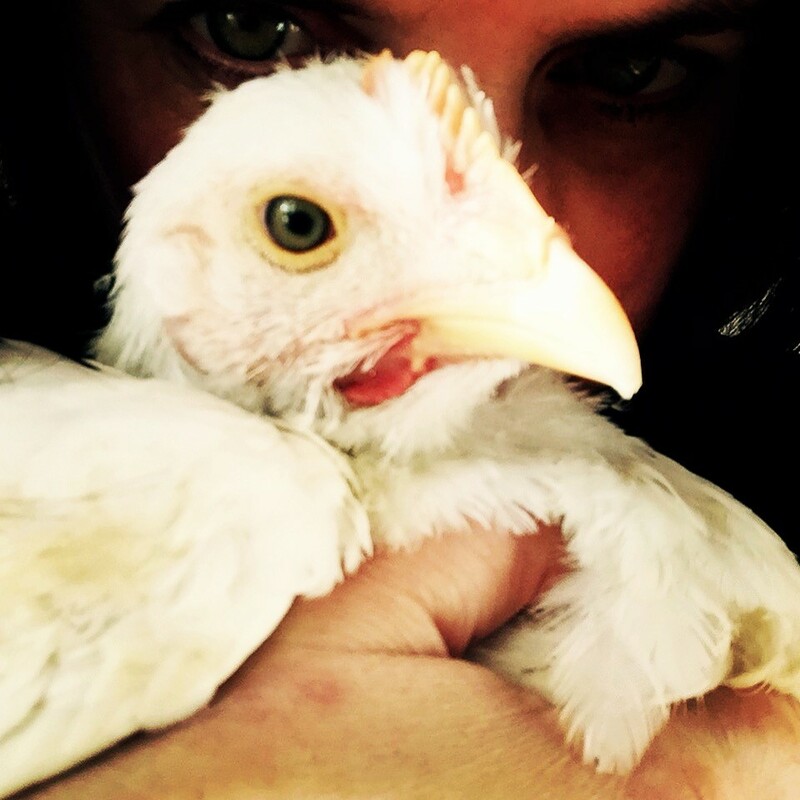 This is Pippa, a 4 week old broiler baby. A broiler is a chicken specifically designed for the meat industry and genetically modified to go from 0 to slaughter in 4 to 6 weeks. These chickens are designed for their meaty breast and thighs and for accelerated growth to minimize the cost of rearing to slaughter age. For Pippa and the billions of other broiler babies shackled for slaughter at this young age, it means they never get to know the love and protection of a mama hen, they suffer the pain and discomfort of accelerated growth (think growing pains continuously x 10), the associated difficulty walking having to support their bourgeoning weight on ill equipped baby legs (often leaving them lame by slaughter age). Heart troubles later down the line when their organs can no longer support their massive weight gain. What does this mean for rehabbers and carers of these intelligent, curious and affectionate birds? For us, it means being full time mama to a baby chick in a large body. Their bodies might be ‘mature’, but their psychological development and needs remains that of a tiny chick. It means constant care, an early regime of heart Meds for the broiler, and a broken heart for their carers when they leave us, their lives often cut short by heart failure somewhere between 6 months and 14 months. We watch them become more sedentary, less able to partake in natural chicken behavior, and the steady decline of quality of life of our beloved babies. Sometimes we need to preempt heart failure and make that difficult decision to euthanase. It means we look at people who choose to eat chicken with confusion, and those who continue to eat chicken when they have the facts with horror. Not judgement, just plain disbelief. Why why why would you choose to contribute to this cruel industry when you know better. What does this mean for you as a chicken eater? Chicken eaters are eating baby chickens regardless of wether they are free range or not. ALL chickens slaughtered for meat are broilers. They have all experienced the trauma of transport and horror of slaughter. It’s not an easy or nice end, and it is certainly not a comfortable life prior to that. Don’t be conned into believing these babies have a good life and swift end. 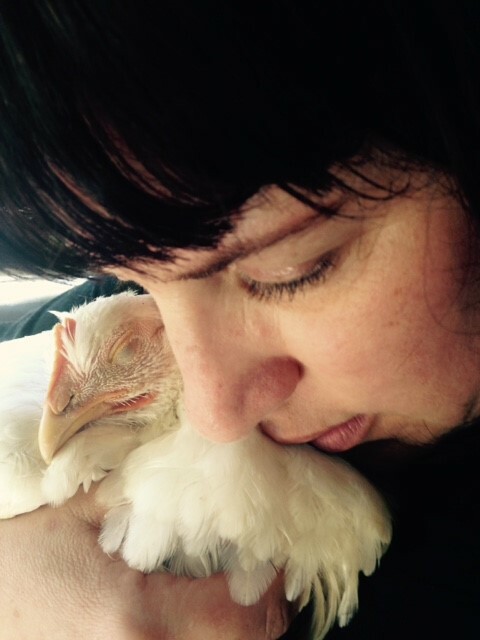 For me, today I love and hold Pippa, offer her the safety of my wing, and tell her I will make her as loved and comfortable as I can for her short life with us. I start to steel my heart today for the inevitable loss to come.